Prepare coffee with the Black Decker DLX1050W coffee maker that brews 12 cups at once. Have your coffee ready when you getup, as this Black Decker coffee maker comes with a programmable clock that can be timed to brew the drink. Brew-pause function of this 12 cups coffee maker allows you to enjoy a cup of coffee while the brewing is on. Pour a cup anytime of the day as the non-stick warming plate of this Black Decker coffee maker keeps the drink warm for hours after brewing. The glass carafe of this 12 cups coffee maker makes it easy to serve the drink with its dripless pour spout without spilling on the table. Pamper yourself with a tasty cup of coffee with the Black Decker DLX1050W coffee maker. It takes a lickin and keeps on ticking and we love it! I brought the DLX10502 12 Cup Coffee Maker because it has a timer so that I can have my husband's coffee ready in the morning at 4:00 AM without me having to rush fixint it. There is nothing that we dislike about the coffee maker it's great and I look forward to buying other products. Black Decker a reputation of standing behind its products and also seems to last longer than other appliances we have tried in the past. Consistently performs well and realy lasts! This Black and Decker coffee pot has all the bells and whistles you would want. 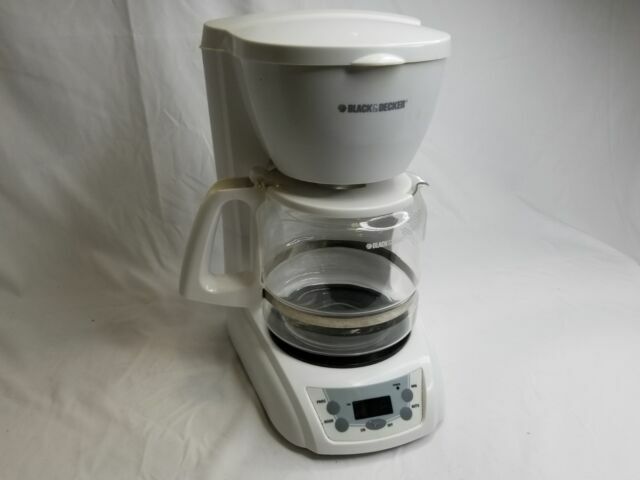 I have tried other automatic coffee maker brands and found that Black and Decker is the most consistently well made and long lasting. Just what I needed. Works well. Priced well. Shipped quickly. Replacing an old Mr. Coffee. Counter space used is the only con but it is a 12 cup unit after all.